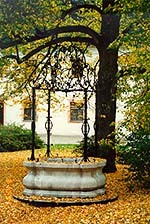 The town's decorative iron-bared well, used to stand in front of the Town Hall until 1878. The upper part was given as a gift to prince Johann Salvator, who was stationed in the town Komárno as an officer. Later he rebuilt it in his place at the Gmunden castle in Austria. This work of art is closely connected to our town Komárno, so the replica built on the Europe Place will be one of the downtown's most beautiful spots we can be proud of.